Docker is an economical alternative to conventional virtualization. Because each Docker container shares the underlying operating system, it enjoys the resource isolation and allocation benefits of VMs but is much more portable and efficient. Rarely has such young software raised so much attention in such a short time as the Docker  container manager. 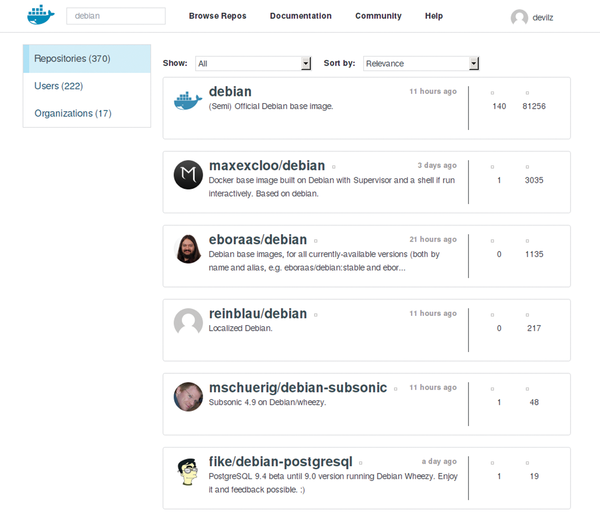 Docker is one of the fastest growing open source developments in the history of free software. Released in March 2013, it made it to version 1.0 in June 2014 and was declared ready for production. In the same month, Docker was already part of Red Hat's RHEL 7 release. Further cooperative agreements exist with Canonical, openSUSE, CoreOS, VMware, IBM and others. Moreover, Docker is a member of Google's Kubernetes project . The image associated with the name Docker sums it up: a ship (computer) is loaded with containers that you can stack, transport, isolate, and protect (Figure 1). Docker containers in IT are isolated virtual environments for isolated execution of processes and applications. Docker is currently used primarily for developing, testing, and deploying applications and can isolate them along with their dependencies in containers. These applications have practically no overhead and can run nearly as fast as native applications. Figure 1: The Docker logo says it all: The underlying computer is loaded with containers containing isolated images. Unlike the well-known hypervisors  VirtualBox, VMware Workstation, HyperV, Parallels Desktop, or Xen, a Docker container doesn't need its own operating system. Each container uses the basic functions of its host system and is therefore self-sufficient and isolated from other containers. Only the host's kernel needs to match that of the guest. 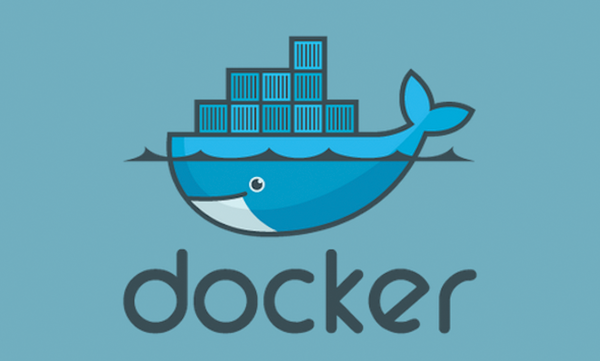 Docker uses the group (cgroup)  and kernel namespace  technologies. Namespaces serve to isolate and protect, whereas cgroups ensure that the container can use the resources selectively granted to it by the host. Until version 0.8 (1.3 is the current version) Docker also availed itself of the functions of Linux Containers (LXCs)  but eventually developed its own API named LibContainer in version 0.9 that is also available to other projects. Currently, Docker is mainly used as a Platform as a Service (PaaS) , but it is becoming quite suitable as a resource-friendly alternative to desktop virtualization (Figure 2). Graphical tools are being developed to handle containers, and I will present one of them, Panamax, later in this article as one of the first interfaces its kind. 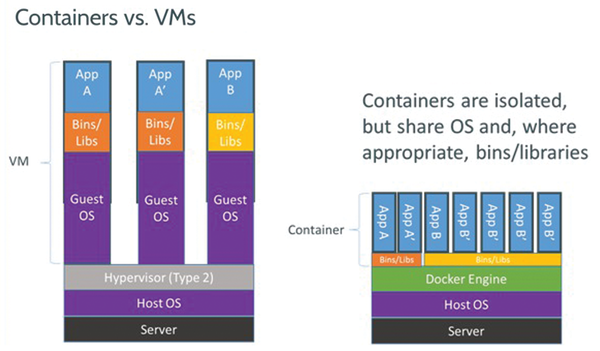 Figure 2: Comparing Docker with a virtual machine. Although VMs implement a whole OS for each instance, Docker shares an OS for all instances. The Docker system consists of three main components: a daemon, a client, and images. The daemon is responsible for orchestrating the containers; the client is what you use to control Docker with commands. The client and daemon can run on the same machine or the client can contact the daemon on a data center server or over the cloud. Docker images are the equivalent of virtual machines (VMs) for VirtualBox or appliances in VMware. Compared with these, Docker images are extremely space-saving, can be stacked, and can be versioned in a CVS . 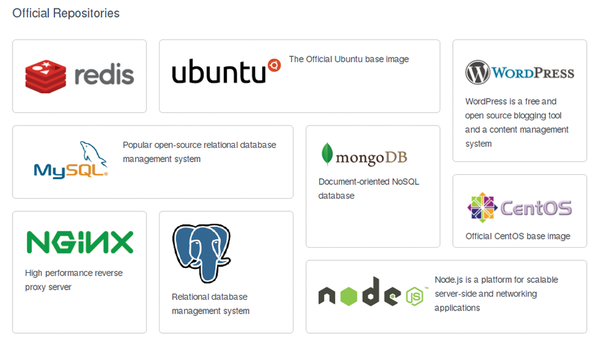 The Docker hub is laid out as Software as a Service (SaaS)  and includes the repositories that now have around 15,000 complete image recipes (Figure 3). These are different from base images, which represent a base operating system along with related images containing one or more applications. Creating your own images isn't rocket science after a bit of training, but you need to know the command language of the distribution. An example would be to create an image using WordPress, PHP, MariaDB, SSH, or Nginx. Figure 3: The Docker hub provides thousands of ready-to-use images. Thanks to the overlay functions supplied by Aufs  or the Device mapper , Docker has an efficient back end to store the containers. Each container, to put it simply, is stored as a transparent layer. These functions are the same ones that allow us to seemingly write to a Live CD (Figure 4). Quite recently, Btrfs  has been playing a role as well with its snapshot function. Details on the different filesystem functions for storing and managing containers can be found in Red Hat's documentation for their Atomic  project, a container operating system  still being developed. Figure 4: The Docker layer model is similar to the layers on a Live CD. Before I start going into details, I'll clarify things a bit. A Docker image is just a read-only template, a kind of recipe. A base image  provides rudimentary operating system functions and can have a parent-child relationship with other images that interact with the base image on various layers. For example, this could be an ownCloud image, which I'll get to later. As a rule, containers consist of several images that contain all the functionality and dependencies that the content of the container (an operating system, application, or service) needs at run time. The basic handling of Docker containers is through a command-line interface resembling Git  and is easy to learn. 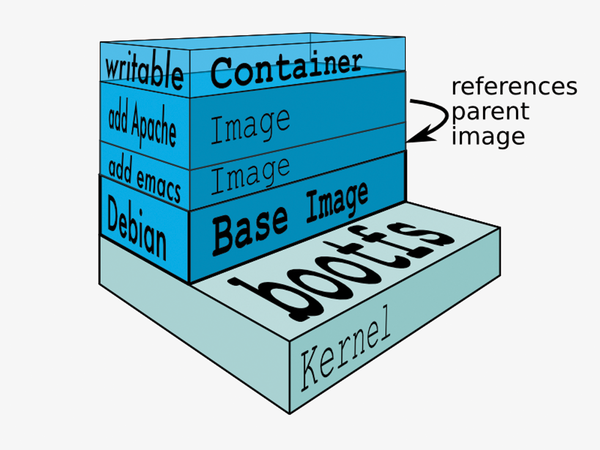 The "Containers, Images, and Docker Files" box provides more information on how things work. To understand better how an image is created, look at the description of the ownCloud image in the Docker hub . The Dockerfile tab shows the important parts of the image. An image also includes licensing information and a README file that goes into specifics. It's pretty clear what this image does and why it's a template. The FROM line at the top identifies the base image being used – in this case, Debian Stable (Figure 5). When you download Dockerfile, each line beginning with RUN is run in sequence. First, wget is installed with an archive key, the ownCloud repository, and its dependencies. The template then sets pre-installations of the Apache web server, which, in this case, is in the base image or needs to be installed later. You can then load this complete image into a container where the base image is also loaded. Containers are by default isolated through "deny all" policies and can't communicate with the outside world. If you do want this, use EXPOSE parameters with port numbers to expose. The VOLUME parameter allows connecting with the host's filesystems or another container at a specified location. Since Docker 1.2, the containers' rights and privileges can be controlled granularly  so that the combination of cgroups and namespaces can meet their full potential. Figure 5: Debian in execution. A container thus consists of a base operating system with apps and metadata added by users. The image tells Docker what the container should include and, where appropriate, what command is used for startup. In the simplest case the container starts right away with a shell, although far more complicated processes can occur, such as automated test runs. waits in the background for input. You might think Docker is a tool reserved for gnarly sys admins, useful only to service companies that run complicated SaaS applications, but that is not true: Docker is useful for everybody. A recent flurry of activity in the container space raises several interesting questions about security among a number of operational aspects in the enterprise environment. If you want to distribute your programs across multiple platforms, you need to prepare them to run in foreign environments from the start. Linux container technology and the resource-conserving Docker project let you test your own Perl modules on several Linux distributions in one fell swoop. CoreOS is an operating system for the cloud that relies on Docker and also lets you build compute clusters out of the box. Run your application smoothly and portably in the cloud with the Docker container system. This workshop takes a practical look deploying Docker with the OwnCloud cloud environment.